Carrizo's high ceiling on its hedges allows it to participate in improving oil prices. It is now expected to generate around $120 million in positive cash flow in 2019. Well-level returns are excellent, and Carrizo claims IRRs of around 100% for some of its wells at $60 WTI oil. Carrizo is cheaply priced at around 3.7x projected EBITDAX at current 2019 strip prices. Carrizo Oil & Gas (NASDAQ:CRZO) is fully participating in rising oil prices as its hedges won't start limiting its upside until oil prices get around $10 higher. As well, with the majority of its oil production coming from the Eagle Ford, the impact of volatile Midland Basin differentials is limited. 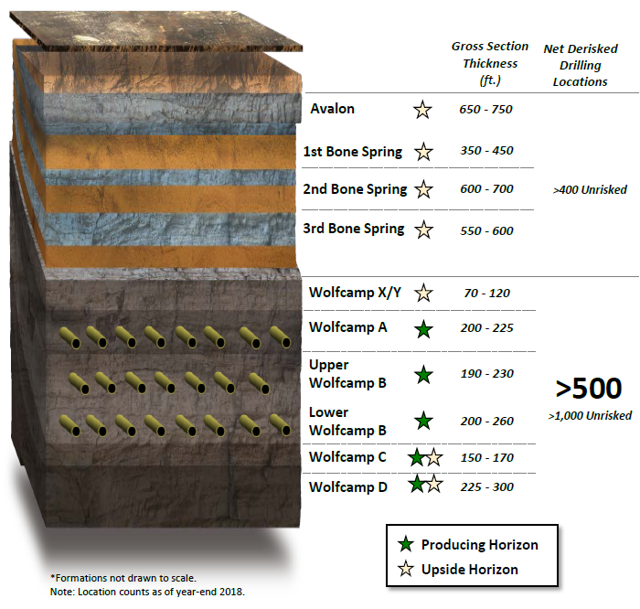 Carrizo claims excellent well-level economics at current strip prices and looks set to generate approximately $120 million in positive cash flow in 2019 at current strip prices. This will help it pay down some of its credit facility and may reduce its leverage below 2.0x by year end. Rising oil prices are benefiting Carrizo, with 2019 strip prices now at approximately $61.50 WTI oil, and with Carrizo's oil hedges having a fairly high ceiling at $74. The Midland basis futures have widened somewhat recently (particularly for Q2 2019), but this should only have a modest impact on Carrizo's realised price for oil since most (71% in Q4 2018) of its oil production comes from the Eagle Ford. On the other hand, Carrizo's realised price for natural gas is taking a significant hit since most of its natural gas production comes from the Delaware Basin, which is affected by poor WAHA differentials. Natural gas is only expected to contribute 4% of Carrizo's oil and gas revenue though, so it isn't that important. A return to historical WAHA differential levels would have the same impact on Carrizo as a roughly $2 change in WTI oil prices, excluding hedges. Carrizo is now projected to deliver $1.091 billion in oil and gas revenue and $1.083 billion in revenue net of hedges. This results in a projection of $779 million EBITDA for Carrizo in 2019 at $61.50 WTI oil and current differentials. After subtracting interest costs, preferred dividend payments, and Carrizo's $550 million capital expenditure budget, it is projected to have around $120 million in positive cash flow now. Carrizo claims excellent well-level returns on average. It appears to point to an IRR of approximately 60% for its Delaware Basin Wolfcamp B wells at $60 WTI oil. Its Eagle Ford Shale wells have an IRR of around 100% at $60 WTI oil, and its Delaware Basin Wolfcamp B wells appear to have an IRR of around 105% at $60 WTI oil. This is based on $3.00 NYMEX natural gas, so the Delaware Basin wells may have slightly lower RORs at the current $2.85 NYMEX natural gas, given that they are fairly gassy. The impact would be only a few percent, though. 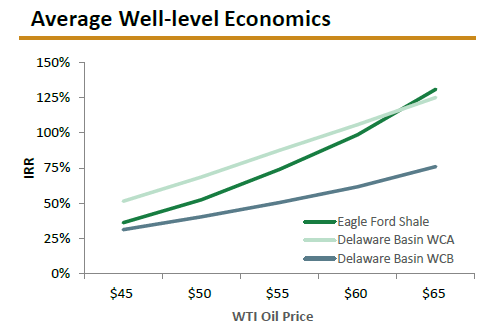 Overall, we can see that the Eagle Ford wells offer comparable returns as the Delaware Basin Wolfcamp A wells at current 2019 strip prices. The oilier nature of the Eagle Ford wells results in more sensitivity to oil prices, and they exceed the Wolfcamp A wells once oil hits the mid $60s. Carrizo potentially has a lot more Delaware Basin inventory, though, if it can de-risk additional zones. It has 500+ net derisked drilling locations in the Delaware Basin but could end up with 1,400+ net drilling locations depending on what it can derisk. For comparison, Carrizo has identified 600+ net Eagle Ford drilling locations. The increase in oil prices and the $120 million in projected positive cash flow for 2019 would reduce Carrizo's leverage to a bit under 2.0x by the end of 2019. If its $200 million in preferred shares were included, its leverage would be 2.2x instead. Carrizo's EV to projected 2019 EBITDAX multiple has declined to around 3.7x now, which appears quite cheap, given its ability to generate strong well-level returns at current strip prices (or lower $50 oil). A multiple improvement of 0.5x would add approximately $4.25 per share in value to its stock. Carrizo appears to be in a solid position right now with its ability to generate a significant amount of positive cash flow in 2019 and reduce its leverage to below 2.0x at current strip prices. Carrizo's well-level economics are excellent at current strip prices (both for the Delaware Basin and the Eagle Ford) and should hold up decently until oil drops below $45. Carrizo appears to be quite cheap right now, given its solid situation, and a rebound in multiples to close to 5.0x could push its stock back into the $20s again. We are currently offering a free two-week trial to Distressed Value Investing. Join our community to receive exclusive research about various energy companies and other opportunities along with full access to my portfolio of historic research that now includes over 1,000 reports on over 100 companies. Disclosure: I/we have no positions in any stocks mentioned, but may initiate a long position in CRZO over the next 72 hours. I wrote this article myself, and it expresses my own opinions. I am not receiving compensation for it (other than from Seeking Alpha). I have no business relationship with any company whose stock is mentioned in this article.